Check out our Video Packages! Please do NOT confuse our Total-Immersion-Flights with one of THOSE scenic or REGULAR introductory flying lessons offered by some other schools. Our Total Immersion Flights are designed to do just that … totally immerse you in flying. You will be challenged by your instructor to do EVERYTHING that a pilot does BEFORE, DURING, and AFTER a normal flight (except landing the plane, of course). Do you have what it takes to continue your training? There’s no better way to find out then to do what pilots do, and to talk candidly with them about your potential to become a real pilot. Still, not everyone is cut out to be a pilot. But if you find peace in the skies, or simply find it inspirational or enchanting, and are conscientious, motivated and a quick study, chances are, you’ll have the right stuff. For most of us know — strange as it may sound — that bliss comes from the right proportion of intelligence and compassion. It is this balance that pilots learn to master, a priceless skill that translates into all aspects of life. A great adventure! You will experience most aspects of flight and flight preparation. Upon your arrival, you are assigned an FAA Certified Flight Instructor who will explain all the items a real pilot accomplishes before, during and after a typical flight. In this real flight lesson, the student will do all the pre-flight procedures, will taxi the aircraft, talk to the control tower, make the takeoff, and once airborne, do many in-flight maneuvers. Of course, the instructor will be sitting next to you instructing you to "push this" or "pull that", but you will do most of the flying! Approximate length about 1½ hours including 30 to 40 minutes of flying. Note: If the student is over 6 feet tall, or weighs more than 200 pounds -- or if you wish to add a passenger to share the fun -- please select "Yes" to the"Upgrade Airplane" option. The procedural and ground portion of the Downtown Adventure is the same as flight #1, but the difference is that the actual flying time on The Downtown Adventure is almost doubled! Due to the limited flight time of flight #1, the aircraft cannot leave the local area, but with The Downtown Adventure, there is sufficient time to get to the city and back. In this flight, you will depart from Chicago Executive Airport and fly over Glenview, Deerfield, Northbrook, Winnetka and Evanston. Once crossing the shoreline of Lake Michigan, you will proceed southbound and perform a circuit of the Loop, the Sears Tower and the Hancock Building. Returning along the north side, you will fly over Wrigley Field, Skokie and Lincolnwood before returning back home. Truly a remarkable experience! Approximate length over 2 hours including 1 hour of flight time. Returning along Chicago’s great North Side, the student will be able to fly over Wrigley Field, Skokie, Lincolnwood, Morton Grove, and will help with the initial landing procedures back at Chicago Executive Airport. Truly a remarkable experience. Note: If the student is over 6 feet tall, or weighs more than 200 pounds -- or if you wish to add a passenger to share the fun -- please select "Yes" to the"Upgrade Airplane" option. Our deluxe introductory flight is one that will be remembered for a lifetime. Just as with flights #1 & #2, the ground portion will introduce you to the basics of flight preparation, but this flight is a short "cross country" flight that leaves the State of Illinois and lands in Lake Geneva, WI. Flying north over Mundelein, Libertyville and Lincolnshire to Great America (Gurnee), you will turn left and head northwestward towards the Chain of Lakes and City of Lake Geneva before actually landing at the Grand Geneva Airport! From there you can enjoy a beverage or light lunch at the Grand Geneva Spa and Resort before returning to Executive. This wonderful flight is made more special by upgrading to the larger plane and bringing a friend to share in the beauty of Southern Wisconsin! This adventure lasts over 3½ hours including 1-1.5 hours of flight time. Note: If the student is over 6 feet tall, or weighs more than 200 pounds -- or if you wish to add a passenger to share the fun -- please select "Yes" to the"Upgrade Airplane" option. This 3 lesson package includes the Downtown Adventure PLUS 2 more lessons. The additional lessons will include 2 more hours of flying and 2 more hours of ground instruction. Topics covered will include weather, maintenance, preflight, aerodynamics, and radio communication, systems of the airplane, aerodynamic stalls and LANDINGS! That’s right, you’ll be attempting some landings right up to your ability! Approximate length of 3 Lessons is over 6 hours including 3 hours of flight time. Note: If the student is over 6 feet tall, or weighs more than 200 pounds -- or if you wish to add a passenger to share the fun -- please select "Yes" to the"Upgrade Airplane" option. A two hour adventure in which two students experience all of the aspects of flight and flight preparation. Upon arrival at the airport, an FAA Certified Flight Instructor is assigned and will explain all of the items a real pilot accomplishes before, during and after a typical flight. In this real flight lesson, the students will do all of the pre-flight procedures, taxi the aircraft, talk to the control tower, help make the takeoff, and once airborne, do many in-flight maneuvers. Of course, the instructor will be sitting next to them, instructing them to “push this” or “pull that”, but they will do most of the flying! In this flight, they will depart from Palwaukee Airport (Chicago Executive) and fly Northeast to Waukegan Airport. Along the way they will fly over Highland Park, Historic Fort Sheridan, Lake Forest and Great Lakes Naval Base. Upon landing at Waukegan Airport, the initial pilot will switch seats with the backseat passenger and they will get to do the return trip! A great way to share a flight lesson! 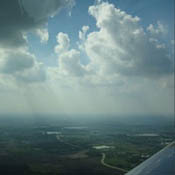 This 2 – 2.5 hour lesson includes approximately 1 hour of flying time split between the two students. There will be a $10 refund fee for any returned flight lessons. The prices listed here are in the 2 seat Cessna. To upgrade to the larger, more comfortable 4 seat aircraft, add $50 to the price of each flight. This upgrade is necessary if the student is over 6 feet tall or 200 pounds. Upgrading will allow the addition of one passenger in the back seat, weight permitting.